Having set his house in order, Xi now aspires to lead China onto the global stage in a far more confident manner than before. Buoyed by the apparent retreat of U.S. leadership in the world, Xi has taken the opportunity to offer his globalist world vision of win-win relationships and joint development. His key initiatives such as the Belt and Road received a boost, while world leaders appear to grudgingly recognize the ironic fact that ‘communist’ China is now the much-needed standard bearer for the free market. Though the U.S. under President Trump has become more focused on domestic politics rather than global affairs, Xi is prudent enough to recognize that the U.S.-China relationship is still the Achilles heel to China’s rise. In this ‘new era’ of larger-than-life political personalities, the relationship between Xi and Trump remains precarious yet vital for regional stability and growth. However much Xi would like to maintain the status quo in 2018, there are still signs that China will enter tumultuous waters in the months ahead. Looming trade actions from the United States, a disruptive and bellicose North Korea, as well as a severely cowed civil service at home more concerned with ‘political correctness’ than constructive dialogue, will all contribute towards a tense environment for foreign businesses operating in China. 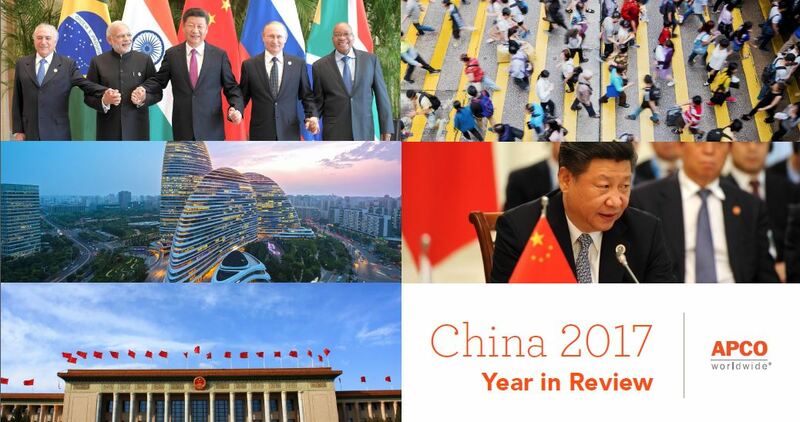 2018 will likely see China continue its confident outward march into the world, but countries will increasingly demand to see actions to back up the words of leadership from Xi. Within the Chinese market, foreign companies will increasingly have to weigh their commercial interests against the increased encroachment of the Party. U.S. companies must be especially careful as they are trapped between the two strongman leaders of Xi Jinping and Donald Trump.